Known for large-scale steel sculpture of geometric designs, Richard Serra has created site-specific pieces that make three-dimensional designs in space. He has also made wall reliefs and floor sculpture from flexible materials that suggest organic shapes. He is committed to the idea of utilizing quality materials and to the concept that process is as important as the final result. Serra was born in San Francisco and attended college at Berkeley and Santa Barbara, majoring in English Literature. He studied art at Yale University, earning a B.F.A. and an M.F.A. in 1964. There he worked with Josef Albers and came into contact with many leading artists of the New York School (Abstract Expressionists). He also had a job working in a steel plant, which had lasting influence on his career. On a Fulbright Scholarship, he studied in France and Italy. In 1977, he married Clara Wyergraf. In addition to steel as a medium for his sculptures, Serra has utilized rubber belts, neon tubes, molten lead, and large metal slabs. In 1968 he made his first Splash-piece, where molten lead was thrown against the point at which floor and wall meet. His 'Prop series" began around 1969 and involved placing large lead sheets against each other, several yards apart, or hung from ceilings. Many of his pieces are enormous three-dimensional configurations from steel beams and steel plates. His goal is to "create a 'field force . . . so that space is discerned physically rather than optically' " (Baigell, 323). Based in New York City, Serra has traveled extensively to oversee his numerous site-specific sculptures including one for Videy Island near Reykjavik, Iceland. Consisting of nine pairs of basalt columns along the periphery of the island, it has been the most time consuming of his works. He also spends several months a year on Cape Breton island in Nova Scotia "to fill up the reservoir." While Richard Serra is primarily known for his large-scale, site-specific sculptures in steel, since 1972, the artist has collaborated with Gemini G.E.L. to produce over 250 works on paper, including the suite of prints shown here. Serra brings a visceral sense of gravity, density, and magnitude to his work across media, and this series is no exception. 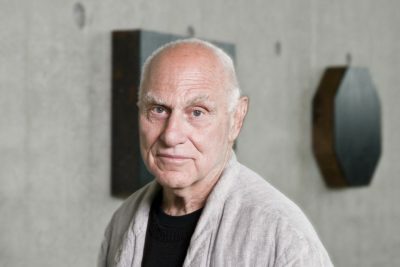 Serra's work can be found in many international public and private collections, including the Museum of Modern Art and the Solomon R. Guggenheim Museum in New York, the Los Angeles County Museum of Art, and the San Francisco Museum of Modern Art. In 2006, Colby College acquired 150 works on paper by Serra, making it the second largest collection of Serra's work outside of the Museum of Modern Art in New York. Richard Serra Known for large-scale steel sculpture of geometric designs, Richard Serra has created site-specific pieces that make three-dimensional designs in space. He has also made wall reliefs and floor sculpture from flexible materials that suggest organic shapes. He is committed to the idea of utilizing quality materials and to the concept that process is as important as the final result.